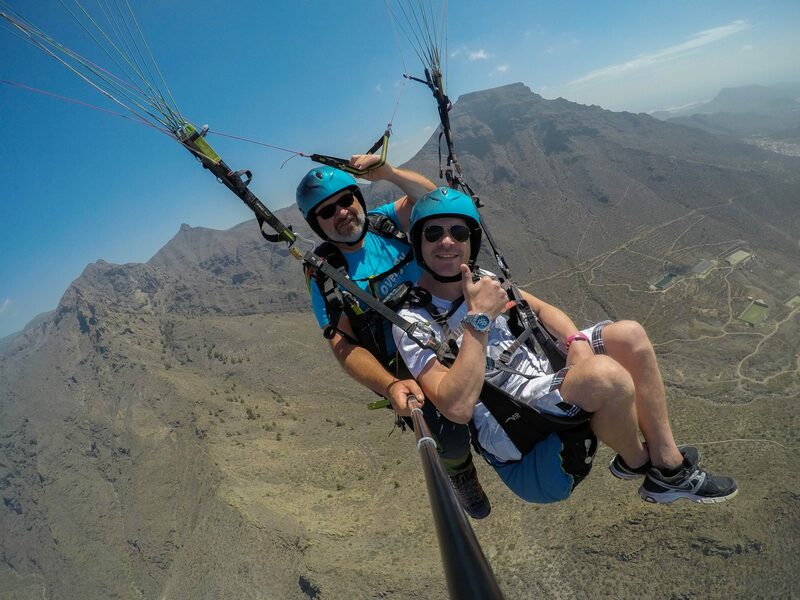 Overfly Tenerife — a company based on many years of experience in paragliding — gives you the chance to make your dream of soaring the skies of Adeje in Tenerife come true! We are quite sure that you are a person who loves to share everything with your friends, so why don’t you share this dream with them floating on a paraglider? We offer you the chance to live this marvelous paragliding experience with the ones that you always have fun with, so come and enjoy our paragliding experience for friends. Overfly Tenerife is a certified paragliding company located in Adeje, Tenerife. Founded by experienced paragliding pilots, Overfly Tenerife aims to provide you with an incomparable experience in the island of Tenerife as you enjoy its marvelous landscape from the air on a paraglider! This is what we like to call heaven, concretely the heaven of Tenerife, and now you can conquer it with us. 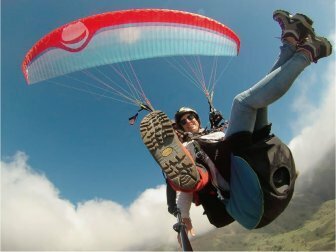 The company offers incredibly fun tandem paragliding flights in which your instructor will take care of every single aspect in order to allow you to be relaxed and just enjoy the ride. If you trust us, there is nothing to worry about. Safety is one of the most important aspects for Overfly Tenerife, so we take special care in making sure everything goes as planned. As we have said before, one of the best ways to enjoy this amazing paragliding experience is with the people who is always by your side having fun, so you should definitely try our paragliding experience for friends. The team will give you a personalized attention seeking to exceed your expectations while you and your friends take part in an activity in harmony with nature as you have never done before! Come and live this paragliding experience with your friends, because here, there are no limits. 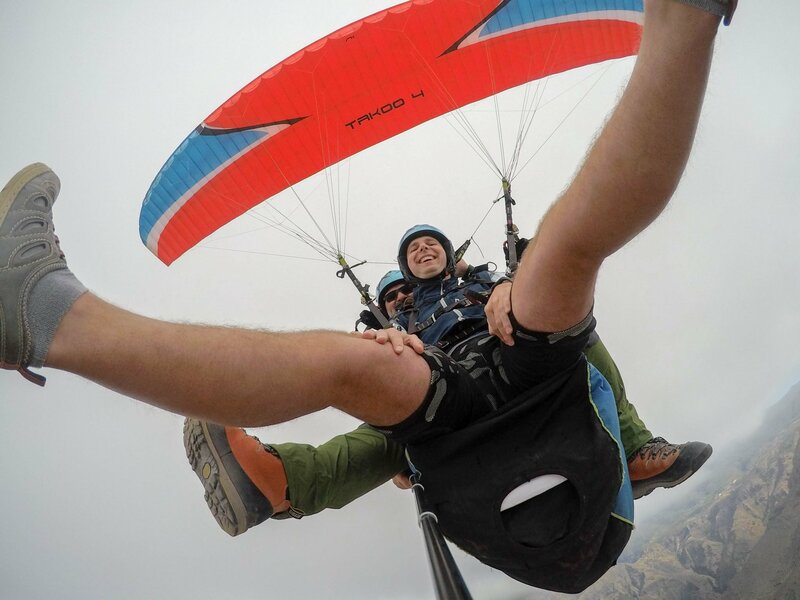 Why should you enjoy a paragliding experience with friends? The main reason why you should live this amazing paragliding experience with friends is, that everything we do, is better if we have a friend by our side. Another good reason to do it with friends is that, for sure, you will always remember that you made this marvelous paragliding activity together. Undoubtedly, this is an experience to live and to share with friends. When is the best time to enjoy a paragliding experience with friends? We could say that anytime is a good time to enjoy this paragliding experience! But if you want to know exactly which the best time is, you should know that the most suitable flying conditions can be found during the winter, starting from October and lasting till March. Furthermore, if you are wondering when the best time is to enjoy this paragliding experience for friends, the answer is also anytime! But above all, on special occasions like birthdays, Bachelor or Bachelorette Parties, time building activities, and so on.